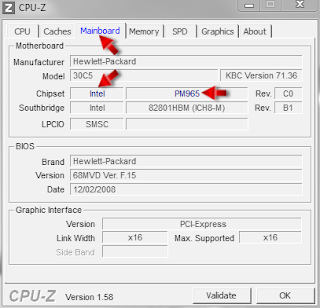 This guide will show you how to choose the right SATA driver to install Windows XP. . Also thanks to to other contributors especially Gustav Rock(CQ42) and Vanilla Blue (CQ40/CQ35/Acer). 1. Do this at your won risk. 3. STEP 3: Choosing the SATA Diver and Slipstream Guide. Note. For certain model such as ACER 4530 please check on your BIOS to enable AHCI mode from IDE mode. Sometimes there are model which do not need to use SATA driver. 1. First you need to install CPU-Z in order to identify the right SATA Driver For you Model. 3. Then Install it by double click on it. 4. Continue till installation finish. 1. At this point you should have CPU-Z installed in your system. 2. You will see a shortcut on your desktop and double click to run it. 3. Then select mainboard panel and look at the chipset. There you will see AMD or INTEL or Nvidia. 4. This information we will use to determine the right sata Driver for slipstreaming process. 5. Take note for the Chipset and continue to STEP 3. STEP 3: Choosing SATA Driver and Slipstreaming GUIDE. For any AMD model use the same sata driver (additinal sata driver link included in the DOC file. Only some ACER model and other model beside COMPAQ/HP need to slipstream the sata Driver. PLEASE DO CHECK IN YOU BIOS FIRST! IF THERE IS SATA MODE OPTIONS, CHANGE FROM IDE TO AHCI. If the process failed and you want to repeat please delete all previous folder and start over again with new folder.